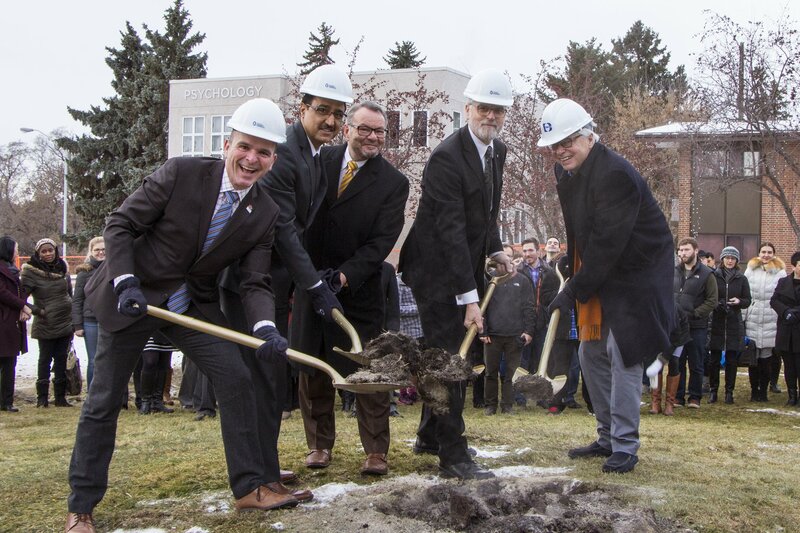 90 years after the official opening of Concordia University of Edmonton (CUE), the Honourable Amarjeet Sohi broke ground on a new and exciting state-of-the-art centre focusing on science, research and innovation. Honourable Sohi, Minister of Infrastructure and Communities, announced the awarding of the Post-Secondary Institutions Strategic Investment Fund to CUE in the amount of $6.72million, which has made this new 30,000 sq.ft. Centre for Science, Research and Innovation on its campus possible. “This Centre is by far the most ambitious project that Concordia has undertaken in her history, both in terms of the physical infrastructure and the scope of our desire to be a leading university in applied research and innovation,” said President Gerald Krispin. The facility will house a number of pioneering initiatives that will help diversify Alberta’s economy through innovative and collaborative research with industry partners, stimulate applied research at the university and nurture Indigenous studies. MP Randy Boissonnault, Bob Turner MLA and Councillor Tony Caterina were all in attendance at this momentous event. means that this exciting building will be open by March 2018. Contact us for more information about CUE’s new Centre for Science, Research and Innovation. See here for the Government of Canada’s news release.